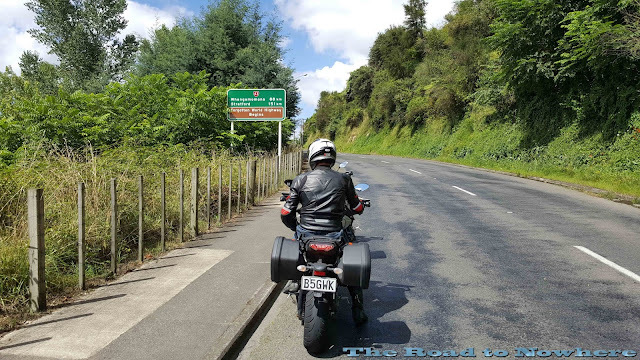 Todays ride from Taupo to New Plymouth is not exactly a long ride but it is one of NZ's top ride's which is the Forgotten World Highway or the Forgotten Highway for short. I'd wondered how and why it had gotten it's name but this would soon become apparent. 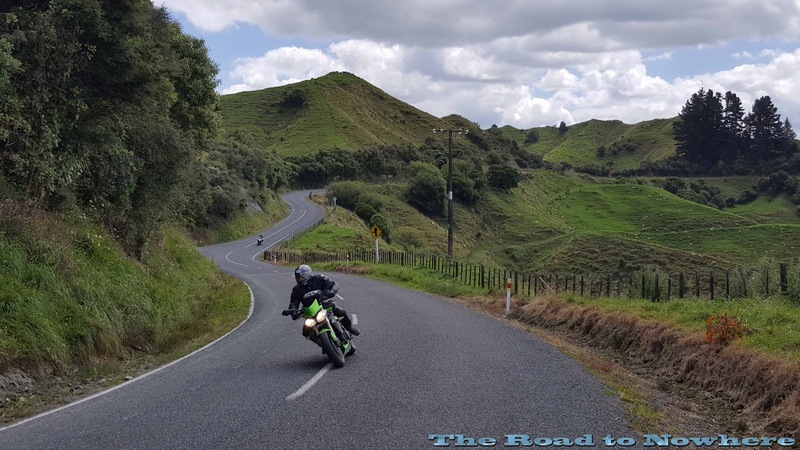 I'd read on forums and websites about this ride as one of the must do ride's and I would have to agree but you need to ride this road with much caution. Riding out of Taupo we headed northwest around the lake and onto highway 32 which took us south towards Mt Ruapehu again but we soon turned right towards Taumarunui, it was a short trip into town with a few twisties thrown into it and you could see the peak of the mountain in the distance which means we couldn't be too far from it. 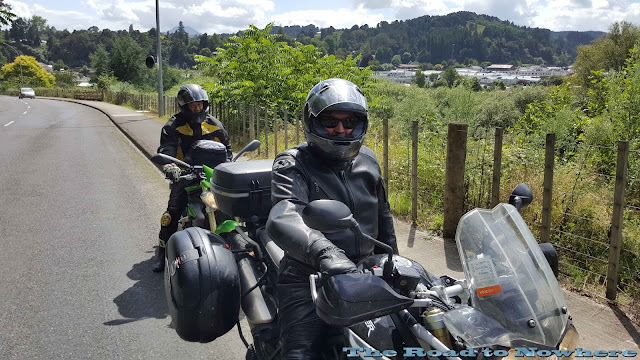 We filled up before tackling the Forgotten Highway as there are no services along its route. 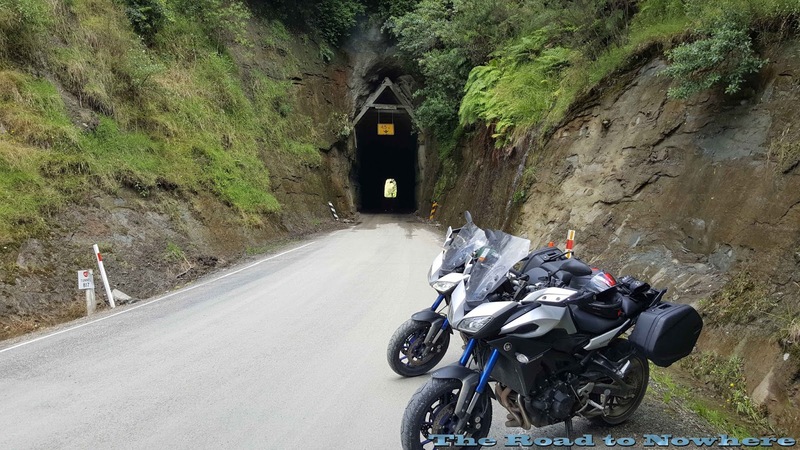 The forgotten highway is only about 150km of twisty fun with some gravel and an ancient tunnel. 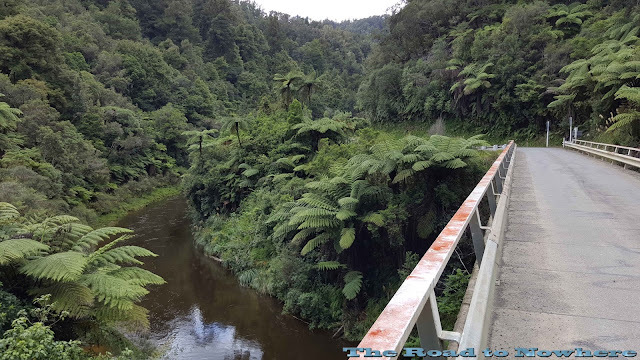 Just out of Taumarunui we came across a slow moving 4x4 which I immediately overtook as did the others. Then for some inexplicable reason the 4x4 driver decided he didn't like a group of bike riders passing him and wildly flew around the others, I caught a glimpse of it in my mirrors, 1 or 2 bends later I looked in my mirror and he was sitting 2 feet from my rear wheel. WTF? I waved him around with my leg because there was no way I was taking my right hand off the throttle as he was so close it would have been disastrous. No sooner had I done that he flew around me within my lane(Fucker) and took off down the road, as the road was twisty he didn't get away too fast and what I witnessed next was some of the most abominable driving I think I've ever witnessed. He was going around both left and right hand bends starting from the opposite lane and crossing the center line to end up in the correct lane and most of these were blind corners, I was expecting him to have a head on crash. Luck there wasn't anyone coming the other way. 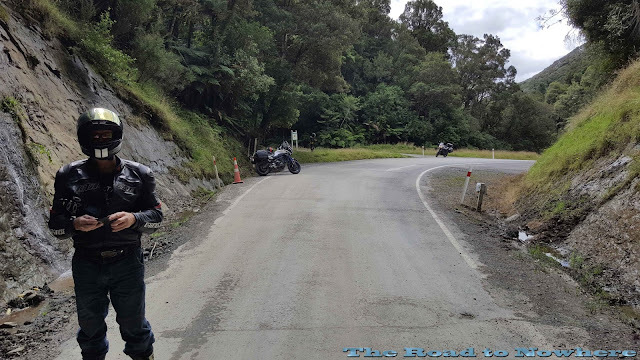 Then about 5 kms down the road the guy pulled over on the side of the road. I was cautious passing him as I wasn't sure what he was up to and whether he would quickly pull out onto the road again but we passed by and he just sat there until he was no longer in view. 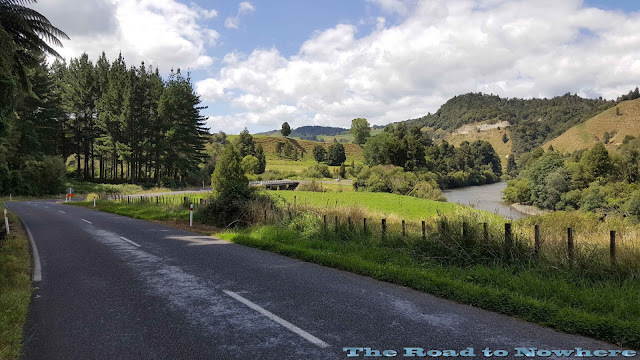 The road sweeps its way through low flat hills with creek crossings and farming land abounds. 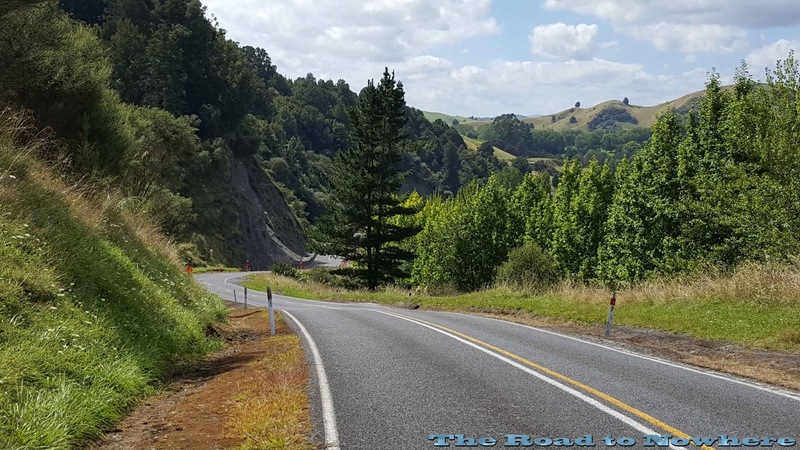 The roads can get tight in sections and you need to be careful as going into a bend the road can have several elevation changes within the one bend. This can really upset the suspension on the Tracer and you're not sure what speed you can go into the bend. Two identical curved bends can have 2 different speeds due to the road surface conditions. I had the suspension bottom out several times along here with the pucker factor rising whenever it happened. The scenery through the forgotten highway is absolutely stunning and everywhere was so green. They must get a lot of rain here and I'm glad it was a nice and sunny day as we rode through here. It would be a treacherous ride in the wet and I wouldn't like to take it on. 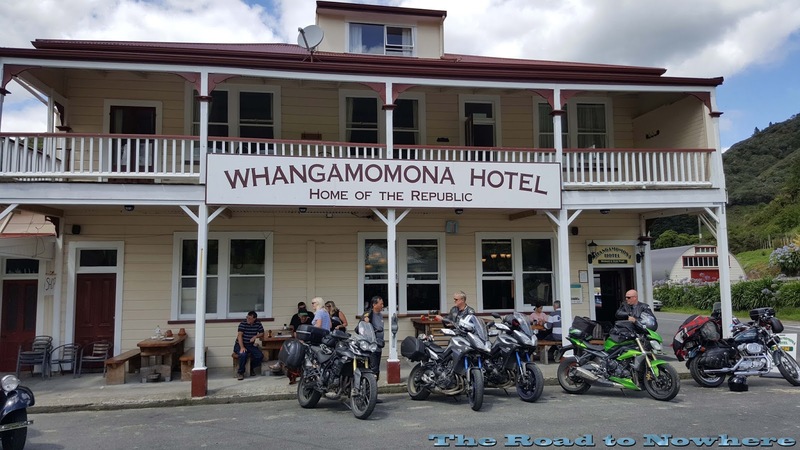 Taking a left turn to Whangamomona it was only a short 47kms to our lunch destination but it took us about an hour. This road obviously has a high rate of bike crashes and when you ride it you can understand why. Nearly all of the bends have unsign posted corners, elevation changes within the bend sometimes there could be up to 2 or 3 changes within the one bend, gravel on bends, rock falls and tree falls, and then there's a section of gravel road. 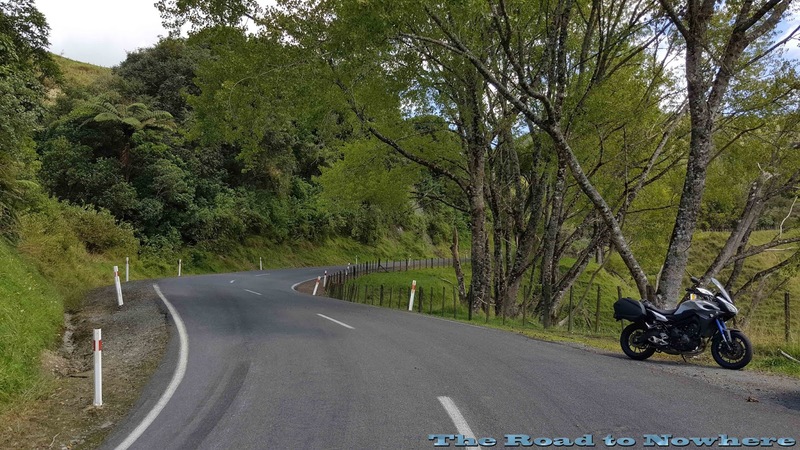 This road has everything you've ever dreamed of riding on a bike all on the one road. Once out here you really get the feel that you're in banjo country. The road has about 15km of dirt on it, normally I'm pretty ok with doing some dirt but they must have recently put down some large blue metal stones which made riding on the dirt a bit tricky. Speeds on the dirt were down to around 35-40km as there was no really discernable wheel track to ride in and there was a lot of large rocks which wasn't favourable with the road tyres on the bikes we had. I found the bike was skating around on the rocks and the best place to ride was actually on the wrong side of the road. We came upon a bridge over a river in the middle section of the road. The river was not clear and beautiful like most of the river streams on the South Island but rather brown and murky. The road turned to tar again and I was cheering but it was briefly lived as it turned to dirt again around the following corner. This also happen another 2 more times and I had my hopes of tar seal dashed a couple of times. The road through the dirt section however was very scenic with large rock faces lurching right up beside the road, I found myself looking up into the scenery several times instead of watching were I was going. After the gravel finally finished I was happy to be back on the tar and the speeds increased again. 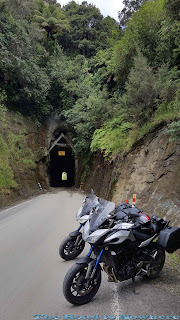 It wasn't much longer before we came upon the Moki tunnel. This little gem is from a century ago and looks it in every way. 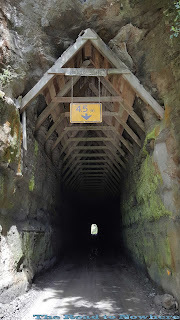 The floor of the tunnel was muddy and slippery and the walls were soaked in water and moss. 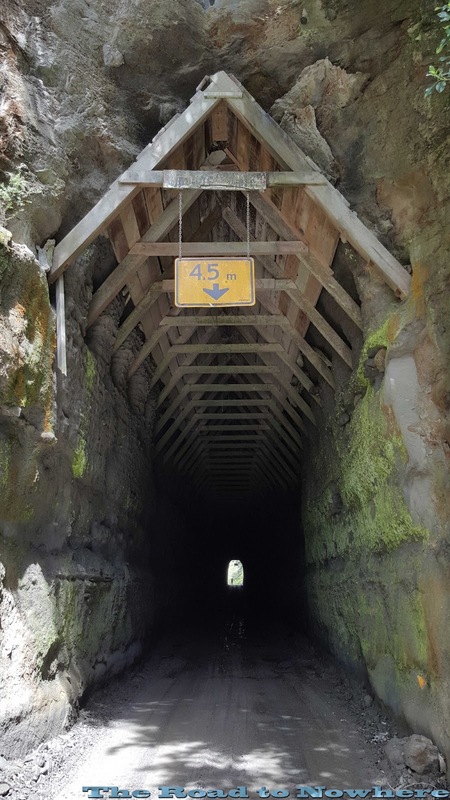 This tunnel had been built about 100 years ago by the early settlers in this area and it really doesn't look like its changed at all in that time. 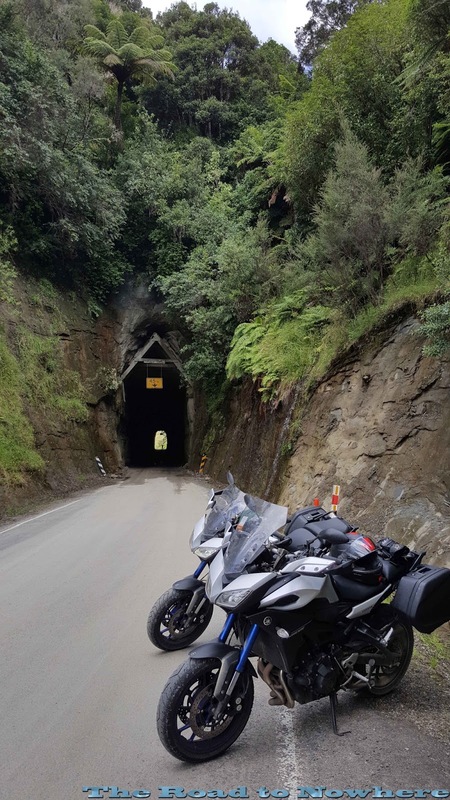 I thought that this tunnel could collapse at any moment when I was riding through it. It looks like the roof is only there to stop rocks from falling onto you as you pass through the tunnel. The tunnel has no lights inside and was very dark, you really couldn't see much further than a few meters in front inside. 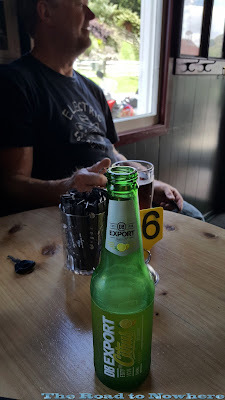 The riding after the tunnel towards Whangamomona was also very good and we came into the Republic soon after. Not sure why the people of Whangamomona wanted to become a republic and leave New Zealand but it probably had something to do with them wanting to marry their sisters. You have to be on the ball riding this road being very careful of gravel patches, tight corners and then the unexpected, like rock falls. I saw several large boulders laying on the road then there was this beauty. The road was 3/4 covered by a fallen tree, the council had been out and put up a temporary 50 zone sign and a few cones. 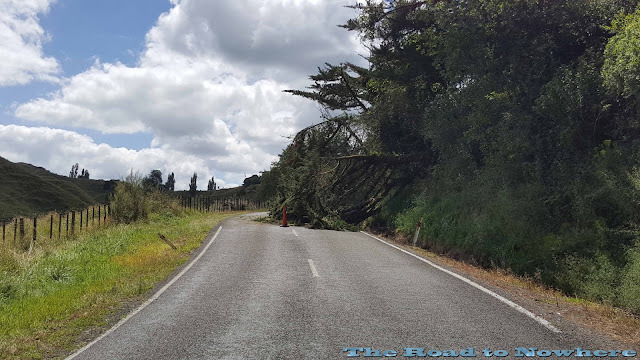 It seems that the local council has also forgotten about this highway and doing any repair works. We were soon in the republic of Whangamomona and both Andrew and Geoff had told me to try the Whanga burger so that's exactly what we did. 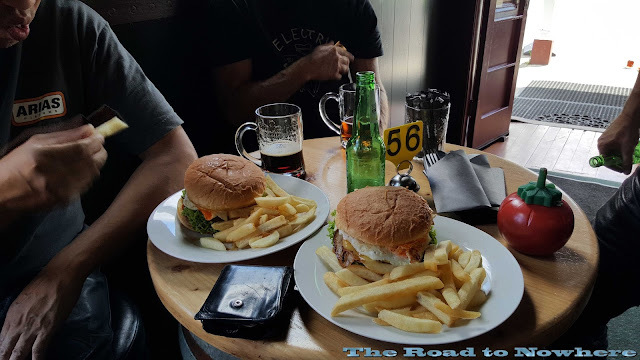 Thanks for the tip fellas the whanga burger was fantastic and lived up to the hype. 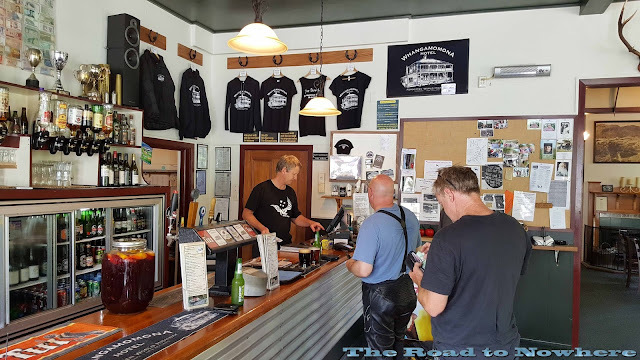 Quite a quaint little pub in the middle of nowhere on a road to nowhere. I tried one of the these DB Export Citrus drinks with lunch, it was only 2% alcohol and was really refreshing, a little like a can of solo or lift with a dash of alcohol. I didn't want a full on beer riding this road as it was pretty demanding. Leaving Whangamomona behind we headed towards Stratford and Mt Taranaki another extinct volcano. 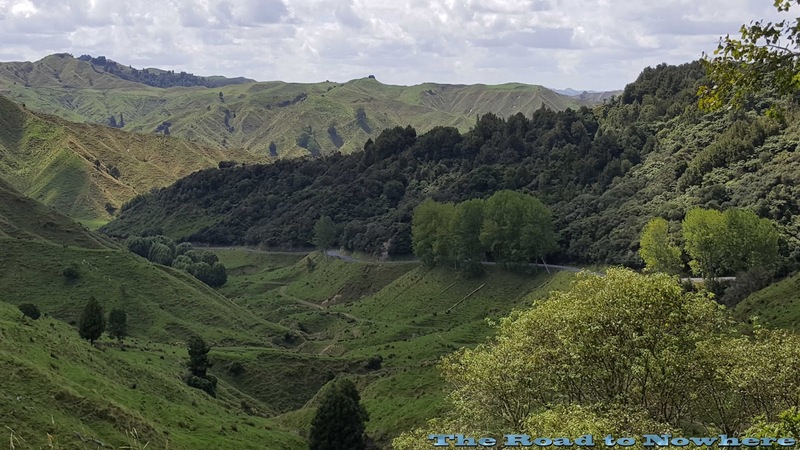 The road out is even better starting with the Whangamomona saddle and after that 2 more saddles, I forgot their names with 25km of twisty fun. The road then opens up before heading into Stratford where we stopped for fuel. This bit was so much fun that I forgot to stop and take any photo's as the red mist descended and the riding was very spirited! 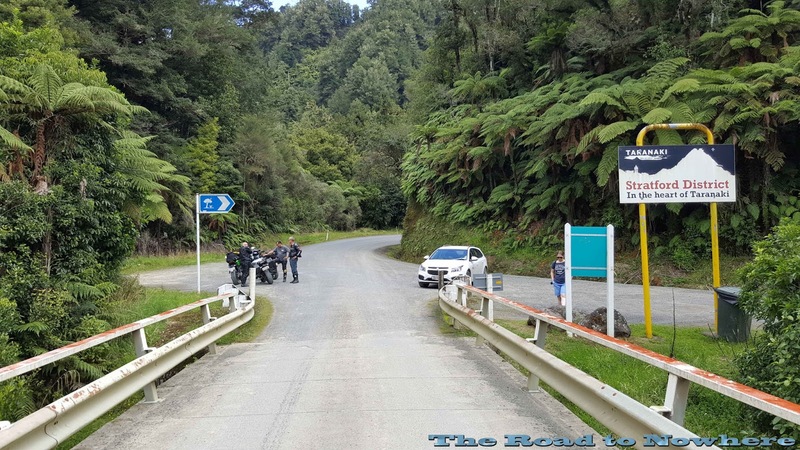 It was then only a short ride up to Dawson's Falls which is a lookout on the southern side of Mt Taranaki. The road was very narrow here and wound its way through a dense undergrowth of forest. Arriving at the look out we were disappointed to see that the peak was covered in cloud however we did see glimpses of the snow covered peak. 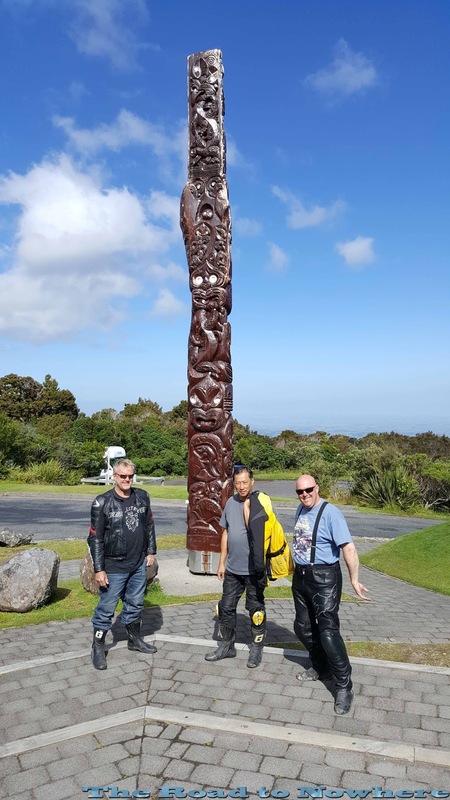 There was a cafe at the lookout but it was closed and there wasn't really much else except a large Maori totem pole. So we kept rolling on around the base of the mountain with coast and ocean visible to our left and the volcano to our right. 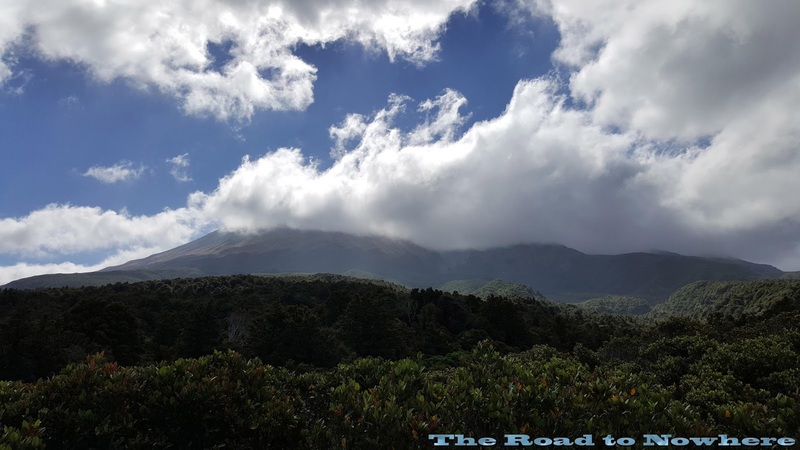 It was along here we took another wrong turn or should I say failed to make a turn and went the wrong way as we legged it into New Plymouth from Okato. It's so easy to miss turns here as some roads just have a road name and nothing else to direct you. 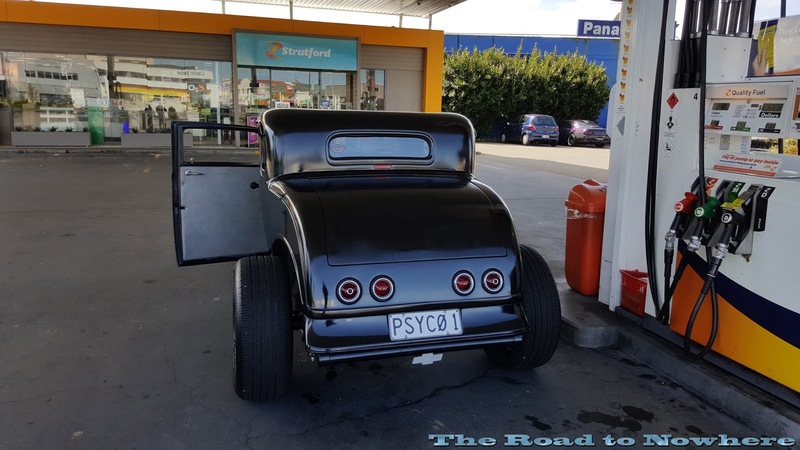 Arriving in New Plymouth we discovered that there was an American muscle car rally on all week. That's why it was so hard to book any decent accommodation here and the place we stayed at The Flamingo Motel was straight out of the 60's or 70's but with 2017 prices. There were a whole bunch of restored old American cars in town and at the motel. Some of them were very well restored. There must have been about 15 muscle cars in the motel we were staying at. The Black Pearl didn't really play up on us today as we kept to the plan of leaving it running when we stopped briefly so all was good. The Forgotten Highway was a challenging piece of road and a must do. 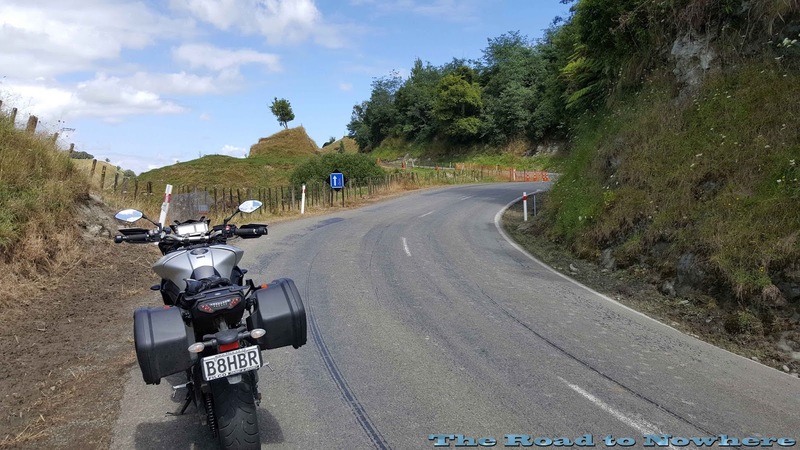 Not the smoothest or best bit of road I've been on but it was lots of fun. Maybe they put down some new stones in those couple of week, that or your version of dirt riding and ours are two completely different things. Besides the dirt it was a really good ride. 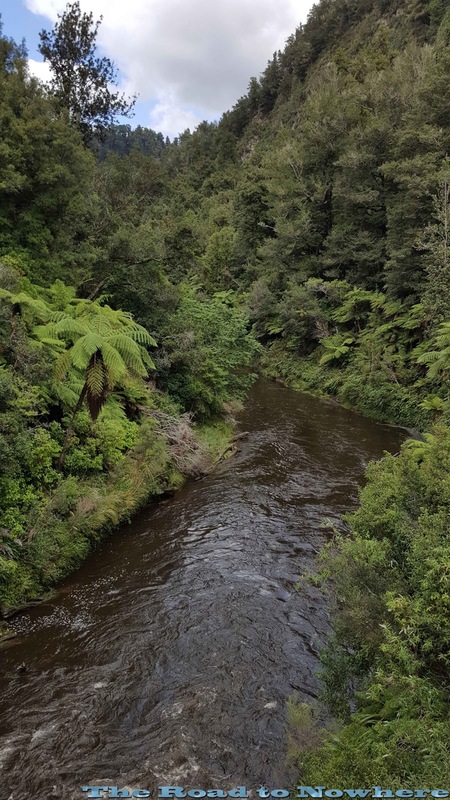 A dear friend lived in New Zealand for a number of years. He told me that the mistake many North Americans make is to book a trip to Australia and a few days for a side trip to New Zealand. He said a better decision would be the reverse. Yes you can see a lot more of NZ in a short amount of time than you can here in Australia because NZ is so much smaller. You could still spend weeks or months exploring NZ. The gravel section was loose when I rode it also. 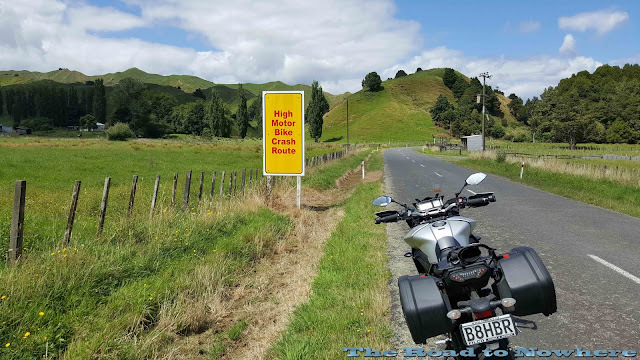 I was up on the pegs to try help but in comparison to the G650GS I had in Australia the Tracer was not very capable on dirt. Not just me that encounters all the crazies on the road then. Never understood what it was about being passed that triggers something in these people, must be wound very tight, but they can be dangerous. Not sure what the guys problem was but he was a full on lunatic. Lucky he didn't kill someone.